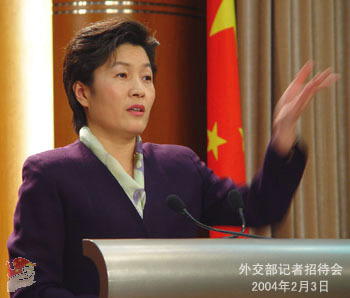 On the afternoon of February 3, 2004, Foreign Ministry Spokesperson Zhang Qiyue held the regular press conference. Zhang Qiyue: Good afternoon, ladies and gentlemen. To begin with, I'm authorized here to announce that the second round of the six-party talks will be held in Beijing starting from February 25th. The date was decided on the basis of consultation among various parties. At the moment, China is discussing with the rest of the parties on the specifics of the talks. China has been having numerous contacts and close consultation with various parties for some time on maintaining the peace process and the momentum of solving the problem peacefully through dialogue. Consensus has been growing gradually. At present, various parties all believe that conditions are ripe for the second round of the talks. It's believed that relevant parties will exert utmost sincerity and flexibility for cooperation in the spirit of mutual respect and peaceful consultation so as to obtain real progress out of the second round of talks. At the invitation of Premier Wen Jiabao, Prime Minister of the Independent State of Papua New Guinea, Rt. Hon. Sir Michael T. Somare will pay an official visit to China from February 9th to 12th. 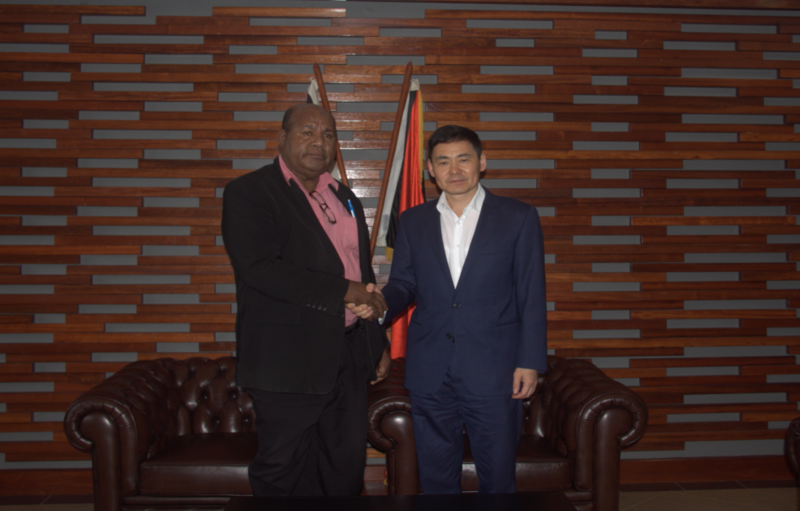 At the invitation of Foreign Minister Li Zhaoxing, Foreign Minister Moana Carcasses of the Republic of Vanuatu will pay an official visit to China from February 9th to 14th. Q: What progress does China wish to gain out of the second six-party talks? Will there be the third and fourth round? Or does China hope to settle the problem in this round? A: As I mentioned earlier, the date of the second round of the six-party talks was set after close consultation among other parties. It's an important step towards a peaceful settlement of the Korean nuclear question through dialogue. We believe that so long as each party pursues sincere peace talks on the basis of mutual respect and consultation on an equal footing, can we create favorable conditions for the settlement of the question. With regard to whether the six-party talks should be a mechanism or not, our goal is to keep and push forward dialogue and the peace process, which we stand ready to work on. Yet definitely, the Korean nuclear question is quite complicated, which requires a solution beyond two or three meetings. The point of departure of China is to maintain peace and stability of the Korean Peninsula and keep it nuclear-free. China stands ready to work towards the direction, hoping that the meeting can obtain real progress. Q: What I know is that the Chinese Government had thought to prepare a joint document prior to the second round of the six-party talks. Has China changed its original plan to agree to hold the six-party talks without any conditions? Did other parties set any conditions for the talks? A: The date of the second round of the six-party talks was already announced earlier, which means that participants of the talks have reached consensus on it. The talks will start on February 25th; therefore there doesn't exist any problem like "setting up any conditions" as you mentioned. With respect to some kind of document to be released during the second round of the six-party talks, I was able to share with you China's thought before. Various parties have held numerous contacts on the second round of the talks. Progress has been made in consultations. Yet it will finally depend on further consultation among various parties to get the results written down. Q: The DPRK didn't announce the place of the talks. Will it be held in Beijing? How long will it last? Will the participants be the same as last time? A: I announced earlier that the place of the talks would be Beijing. I also mentioned the starting date of the talks but I didn't mention when it would conclude. The duration of the talks is yet to be decided, which needs to be arranged on the basis of consultation among various parties. With respect to the members of the Chinese delegation, basically they are the same as last time. Q: The British Times online reports that there've been many deaths in Mainland China caused by bird flu. Can you confirm? Reports also criticized that China has been trying to cover up the epidemic situation and there's no transparency. What's your reaction to it? A: I've also read the report. I talked to the Ministry of Agriculture and Health. I can speak in clear terms that at the moment there isn't any human infection of bird flu in Mainland China. The report is totally baseless. It's the fundamental ethics for journalists to verify facts over and again. At present, the whole nation is going all out to fight against the bird flu. Bird flu is not limited to China. It's a challenge confronting all the mankind, to which a solution requires enhanced international cooperation. I hope that each journalist can deal with the problem in a scientific spirit, report China's prevention and treatment of bird flu in an objective and comprehensive manner, to contribute to the early settlement of the problem instead of making things up or writing irresponsible reports by passing on wrong information. Q: What's your comment on the results of the just concluded Foreign Ministers' meeting of the Forum for East Asia and Latin America Cooperation? A: The second Foreign Ministers' Meeting of the Forum for East Asia and Latin America Cooperation was held in Manila, capital of the Philippines through January 30th and 31st. Vice Foreign Minister Wang Yi headed a delegation to attend the meeting. Discussions were focused on political and economic cooperation between the two regions. Manila Plan of Action was approved to strengthen cooperation within the Forum. Members of the Forum have also proposed many projects for cooperation in the fields of commerce and trade, science and technology as well as human resources. The meeting agreed to grant Nicaragua and Guatemala membership. China believes that the meeting is positive and pragmatic with outstanding achievements. It fully represents the confidence and passion of members of the Forum to promote regional cooperation and enhance its role. China attaches importance to the role of the Forum. Vice Foreign Minister Wang Yi made four proposals on the future development of the Forum: to adhere to its purposes and principles; to promote joint development and prosperity; to explore potential for cooperation and deepen pragmatic cooperation; to seek the broadest common interests. China also volunteered to continue the exchange program of inviting Latin American senior diplomats to visit China. 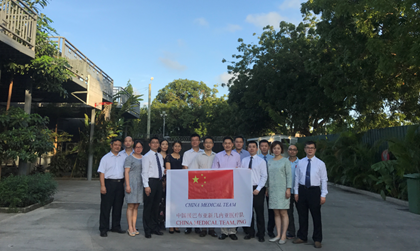 China stands ready to explore and broaden its cooperation with other members and continue to contribute to the healthy development of the Forum. Q: The father of Pakistan's nuclear program has confessed leaking nuclear secrets to the DPRK, Iran and Libya. Is China concerned over it? A: China has taken note of relevant reports. We believe that Pakistan will properly handle the matter. Q: The first patch of the main forces of the Japanese Self-defense Forces will be leaving for Iraq. It will be the first time for the Japanese military forces to officially step on warring foreign territory and to be authorized to defend itself with force. What's your comment? A: We express concern over the dispatch of troops of Japan to Iraq. Due to historical reasons known to all, the military maneuvers of Japan have been a sensitive issue to people of its close Asian neighbours. In recent years, Japan has taken a series of noticeable measures in military and security fields, arousing serious concern at home and in its neighbouring countries over the direction of the Japanese military policy. The dispatch of troops to Iraq this time is another important step taken by Japan, and it will definitely arouse further worries and suspicions among people. As the neighbour of Japan, China hopes that Japan can make earnest efforts to draw lessons from history, act with caution in military and security fields and continue to take the road of peaceful development. It serves the fundamental interests of Japan and benefits the maintenance of regional peace and stability.